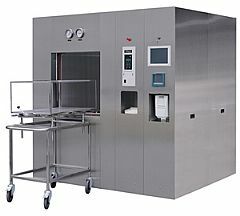 The ever-growing demand for more advanced scientific, industrial and hospital equipment has led to the development of the Tuttnauer line sterilizer. With higher capacity and better performance, Tuttnauer's line of steam sterilizers provides, safe, economical and effective sterilization. Tuttnauer's sterilization method substantially shortens cycle times. This is achieved by evacuating air from the chamber with either a water ejector or a vacuum pump, combined with steam pressure pulsing. A HEPA Filter of 0.2um is provided, to filter the air, which equalizes the chamber pressure after the drying cycle. Model: H44 - Manual Hinged Door - 16" x 16" x 28"
Model: H55 - Manual Hinged Door - 20" x 20" x 38"
Model: H66 - Automatic Hinged Door- 24" x 24" x 36"
Model: H66 - Automatic Hinged Door - 24" x 24" x 48"
Model: H69 - Automatic Hinged Door - 24" x 24" x 36"
Model: H69 - Automatic Hinged Door - 24" x 24" x 48"
Model: H69 - Automatic Hinged Door - 24" x 36" x 60"
Model: H69 - Automatic Hinged Door - 24" x 36" x 72"